When speaking of virus diseases, one usually thinks of the consequences of acute infections ending either fatally or with recovery, in which case the virus is usually rapidly eliminated. Obviously acute virus infections and their pathological effects do occur frequently, and in many epidemics of infectious diseases of animals and man viruses were and still are aetiologically responsible. There are, however, other viruses that have the ability to persist, often for life. 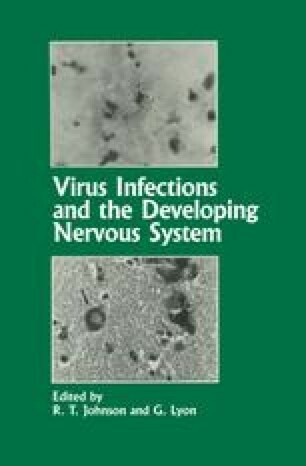 Their pathogenetic potentials are not as obvious, although many illnesses are known to be caused by chronic infections with such agents; in others the viral aetiology is suspected, and it could well be that persisting viruses are more relevant for ailments of animals and man than has hitherto been assumed. Thus, prevention and therapy of chronic virus diseases may turn out to be major tasks for physicians as well as virologists; both are poorly equipped for this. Our understanding of the mechanisms by which higher organisms control acute virus infections is limited and we know even less of the other side of the coin, namely how certain viruses evade the host’s defences. In the case of illnesses caused by the so-called unconventional viruses ignorance precludes the formulation of a hypothesis that would direct rational attempts at prophylaxis, not to mention a cure, once clinical signs have developed. With respect to slow virus diseases caused by conventional viruses the prospects may not be as dismal, although here too great gaps in our knowledge exist. Thus, a considerable amount of work has yet to be done before these diseases are sufficiently understood for their control to become possible, and every model that promises to advance our understanding in this field is worth being exploited.